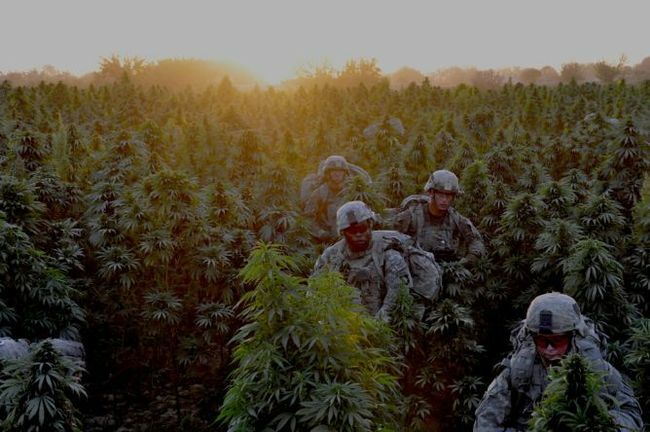 Some American soldiers got an unexpectedly scenic mission in Afghanistan recently when their Chinook helicopters discharged them into the middle of a marijuana field. Laura Rauch at Stars and Stripes reports that the mission for soldiers with Company C and the Scout Platoon, 1st Battalion, 32nd Regiment, 3rd Brigade Combat Team, 10th Mountain Division was to cut off enemy access and supply routes. When the Chinooks landed, a “heavy earthy scent wafted through the cabin.” This wasn’t the dry riverbed the soldiers had been expecting, but instead the ground was moist and slippery from irrigation canals. When they adjusted their night-vision goggles, the soldiers realized they had been dropped into a “massive old-growth marijuana plantation,” about a quarter-mile west of their intended landing zone. “Sir, are you sure we didn’t land in Guatemala?” Sgt. Blaine Zimmerman of Cicero, Indiana, asked company commander Capt. Dennis Call of Albuquerque, New Mexico, who led the assault, as they prepared to move out. Pushing out of the cannabis field was hard work for the soldiers, heavily loaded with obstacle-breaching equipment, radios, ammunition and extra rations. Marijuana plants towered over them as they slogged through the moist irrigated soil.